There is room for 6 in the living room and 6 in the dining room. There is a television, video, DVD, satellite/cable. The music system will play cassettes, CDs and radio. Cooker, hob, fridge, freezer, washing machine, kettle, toaster, microwave. Outside gas BBQ. Notes on accommodation: All rooms have air conditioning to keep you cool in the summer heat! , Outside: Kings palace is in a quiet area but you may hear occasional noise. It has access to a large shared swimming pool, a south facing garden, a south facing patio area . ), sea views, panoramic views, a barbeque. If you are driving there is private parking with the outside areas of the house having external lighting. Utility Room: Iron and ironing board. Cleaning / Towels / Linen / Maid service: Bed linen and towels are provided for your use and are changed weekly. Fabulouse Large Apartment Near all Amenities. We stayed at Toney's apartment beginning of October 2017 the weather was still hot during the day and cooler by night...perfect. The booking procedure was quick and easy making it stress free and Tony e-mails you back very quickly and can't do enough for you. Janet who looks after the apartment was wonderful and very helpful and friendly and is just a phone call away if you needed her. She met us when we arrived, our flight was late at 1.00am in the morning but she didn't mind at all and had put drinks and a few essentials in the fridge for us. The apartment is in walking distance of restaurants / bars and a Lidle supermarket. There is a bus service just outside the complex to get you about and is still quiet if all you wont to do is relax outside on the patio without being disturbed by noise. The complex has a large swimming pool and a child's pool and was fairly quiet when we were there. The apartment is large with 2 bedrooms 1 double and 1 twin the Kitchen /lounge was large with all you needed and was very clean, All rooms had air-con (free) and also had Wi-Fi and satellite TV if you felt the need to watch your favourite T.V shows at no cost to you. The washer was a god send I did all my washing before going back home which was a big help when I got back. The patio area was large and private with a good view with parasol / table /chairs and sun loungers with cushions very comfy. The only down side for me is......please get another parasol for the sun loungers as the sun shines all day on the patio and there's no shade from the sun only if you sit at the table I like to lay on the sun loungers to read my book. Anyone looking for a home from home in the sun with all amenities on the door step and still being quiet..... I would highly recommend Tony's apartment its wonderful. There are plenty of local restaurants and bars within a 5 minute walk of the apartment and the popular areas of ‘Coral Bay’ and the ‘Harbour’ are within a 10 minute drive, where numerous Greek and English restaurants and Tavernas can be found. is a 15 min walk from the apartment. Payment can be made directly by cheque or bank transfer or a credit/ debit card payment website can be provided. This would incur extra booking and card charges of around £50 Changeover Day: We try and accommodate any changeover day/time. Notes on prices: Substantial discount of £100 on second week. 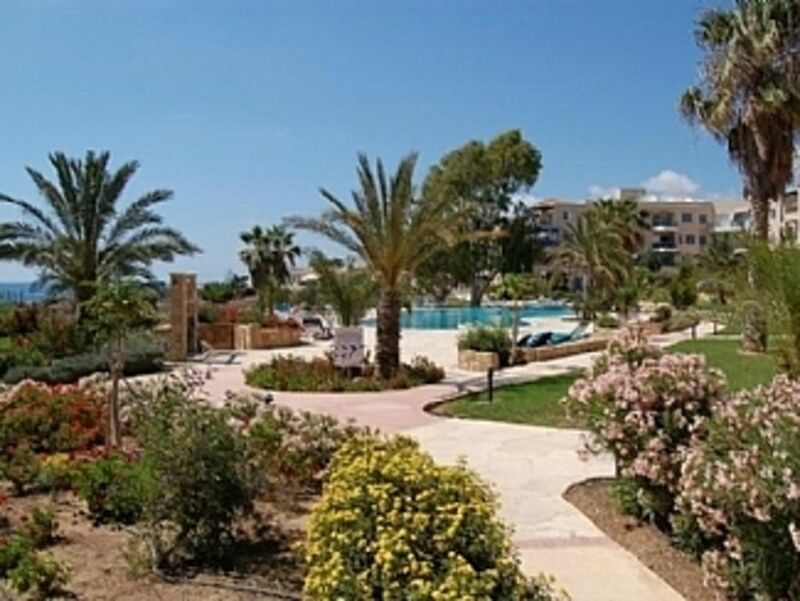 Prices include transfers to and from Paphos, air-conditioning and welcome pack.